Last week I was outside of Vandenberg Air Force Base to watch the launch of SpaceX’s Falcon 9 rocket. (It was perfect weather and an amazing experience for my first launch!) To commemorate it, this is another one of a handful of product case studies I wrote to help understand successful product launches. Falcon 9 was finished in early 2010, and had been in development since 2005. Its first flight occurred on June 4, 2010, a demonstration flight to orbit where it circled Earth over 300 times before reentry. Development costs for v1.0 were estimated at $300M. NASA estimated that under traditional cost-plus contracts costs would have been over $3.6B. Total combined costs for F9 and Dragon up to 2014 were ~$850M, $400M of that provided by NASA. By September 2013, the SpaceX production line was manufacturing 1 F9 every month. (1) Value created — Simply describe the innovation. How did it create value? The Falcon 9 is a two-stage rocket that delivers payloads to Earth orbit or beyond. It’s a transportation vehicle to space. F9 drastically reduced launch costs, allowing NASA and small satellite companies to send payloads at a fraction of the cost. (2) Value captured — Competitive advantages, barriers to entry. Why didn’t incumbents have a reason to fight them? F9 was a disruptive innovation, built from the ground up at low cost. Incumbent launch companies had no reason to start from scratch and lower their profits when they had strong (mainly cost-plus) contracts with existing customers. Industry was viewed as very inelastic and that little demand existed at low end. One of a handful of product case studies I wrote last year to help understand successful product launches. Apple’s iPhone was announced December 9, 2007 and released June 29, 2007. It was $499 for the 4GB version, $599 for 8GB. After 8 years it had captured 50% of U.S. smartphone market and >66% of sales, with 100 million users. Extension from existing Apple network — iTunes, Mac OS, iPod. Economies of scale exist with integration and complexity of engineering. Switching costs once owning an iPhone. Strong habit attached to usage many times / day — strong attachment to UX. Phone makers saw it as toy for rich people at first. Computer makers didn’t see it as a computer (low-end disruption). Out of the many books I’ve read in different subjects, below is a list of some of my favorites with some brief commentary for some of them. There are a few other “Mental Model” categories (psychology, history, economics, ecology, etc.) that I left out — hopefull they’ll be the subject of another post. A word cloud is a visual representation of a group of words, with the size of each word weighted to how many times it appears. 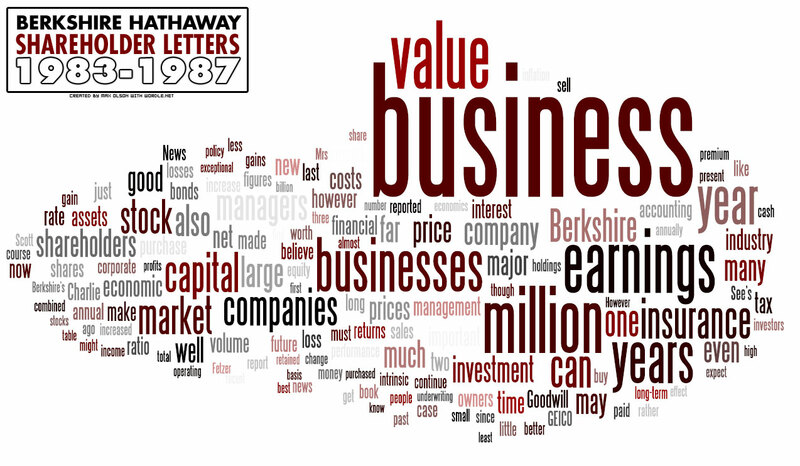 The above two examples use the Berkshire Hathaway shareholder letters for the 5-year periods ending in 1987 and 2007. You can see some often-used words between the 20-year period: business, earnings, value, company, insurance. Word clouds are a good representation of what subjects the author is focusing on.